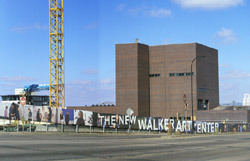 Walker Art Center selects Swiss architectural firm Herzog & de Meuron to collaborate on development of a site plan for the Walker's campus and the design of its expansion; Minneapolis-based Hammel, Green and Abrahamson, Inc. (HGA) selected as Herzog & de Meuron's local architectural partner for the project. Walker Art Center unveils conceptual design for the expanded Walker campus. 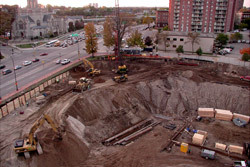 Construction on City-owned underground parking facility begins. The parking facility will be located underneath the Walker's new four-acre park and expanded facility. The Walker Art Center launches its first-ever institutional image campaign, focusing on broadening audience awareness of different ways and reasons to spend time at the Walker. 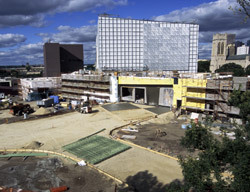 The campaign is featured on the construction site fence along Hennepin Avenue. 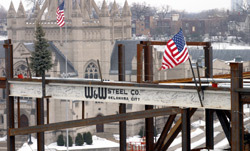 The last major structural beam, signed by members of the Walker Art Center's Board of Directors and staff, is lifted into place and celebrated with a traditional "topping off" ceremony with an evergreen tree and a United States flag. The push broom located to the left of the tree symbolizes a "clean sweep" (no lost time due to injuries). 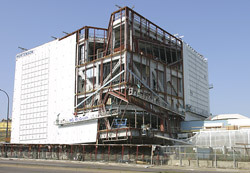 Closing in on the final months of construction, the new 130,000-square-foot Herzog & de Meuron addition takes shape. A support grid is readied for the final skin of stretched and crinkled aluminum pillows that will catch the light in ever-changing patterns. Angular cutouts, which await glass shipments from China, will become enormous windows overlooking the city. In a major show of support for the Walker Art Center's expansion effort, the Kresge Foundation of Troy, Michigan, recently awarded the Walker a $2 million challenge grant--the largest of three local grants given. To meet the Kresge challenge and reach our $92 million capital campaign goal, we will need to secure $11.4 million during this public phase of our fund-raising effort. 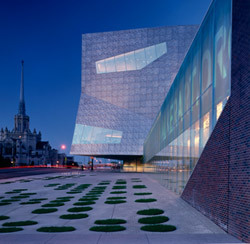 In April 2005, the Walker Art Center opened its shimmering, expanded facility designed by Herzog & de Meuron--a place where art, ideas, and audiences come together.